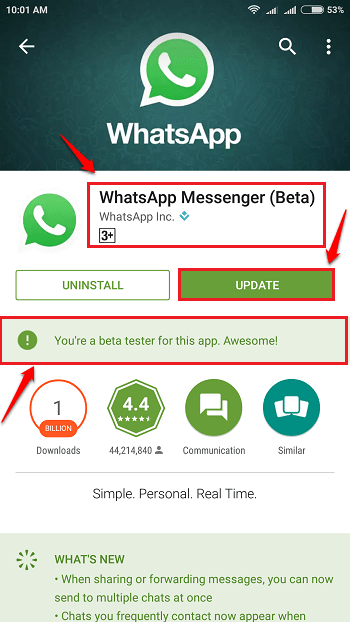 What Is Beta Testing And How To Be A Beta Tester For Android Apps:- Beta testing is also known as user testing. As the name suggests, it is the testing that is performed by the end users. Considering the life cycle of a software, the beta testing phase can be considered equally important as any other software lifecyle phase. A software, at the end of the day, is supposed to satisfy its user; that alone is its ultimate job. So by giving the users a chance to check for an app’s functionality, reliability, usability and compatibility, the developers are giving themselves a self assurance that the app is going to be a success. 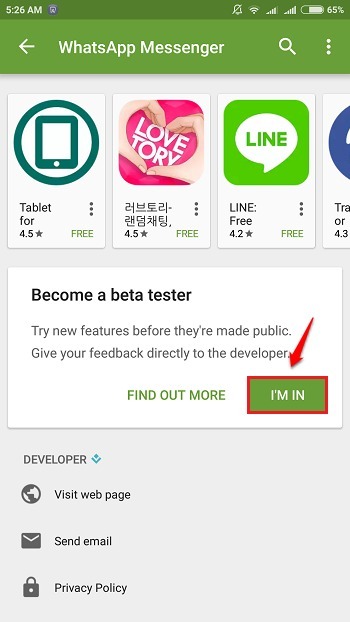 By signing up as a beta tester through Google Play Store, you can also take part in this wonderful development phase. Dive into the article to learn how to be a beta tester of your favourite Android application. Note: A beta version of an application will have features that the normal versions do not have. These features could still be under development and thus the application could be in an unstable state. The job of a beta tester would be to use the application in a normal manner and to find out if it’s giving any undesired outputs for any of the desired inputs. Not every application in the Play Store support the beta tesing feature. 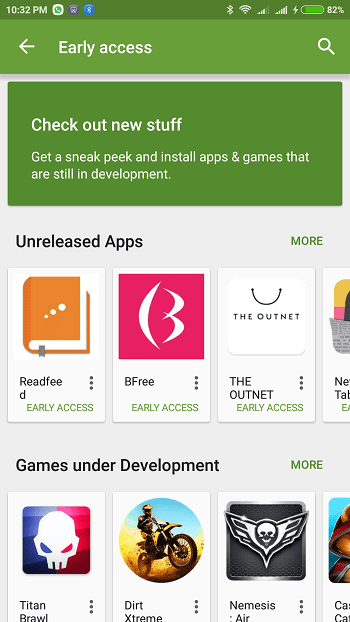 Launch Play Store and search for the app that you want to be a beta tester of. In the screenshot given below, I have searched for one of the most popular chatting applications, Whatsapp Messenger. 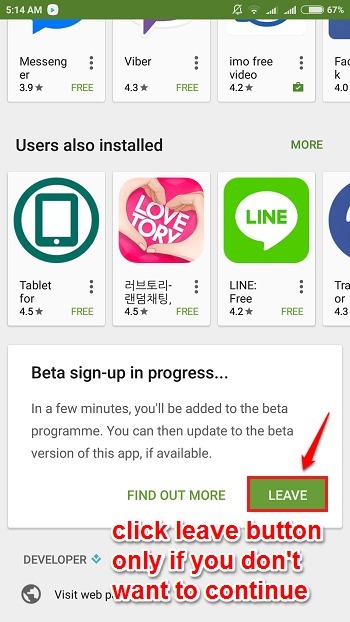 Once you find the app, scroll down and check whether there is a section named Become a beta tester. Click on the I’M IN button to be a beta tester for this app. If there is no such section, then it means that the app that you have chosen doesn’t support beta testing. When asked for confirmation, click on the JOIN button. 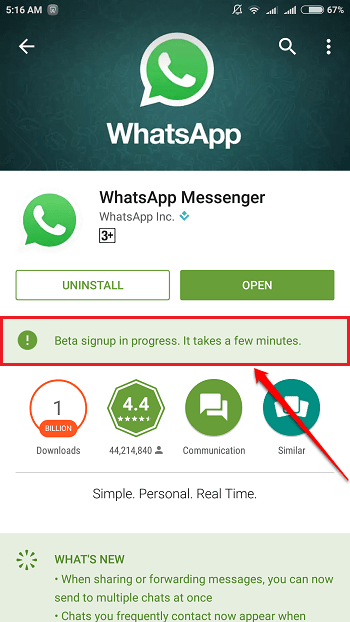 Wait a little while for the app to sign you into its beta testing programme. If you have second thoughts about this, you can always hit the LEAVE button and stop the process. Scroll up and wait till the signup process is over. Once you are enrolled into an app’s beta testing programme, you will recieve a message saying that you have become a beta tester for the chosen app. You can now update to the latest beta version of the app to get the fresh features before anyone else. Enjoy! 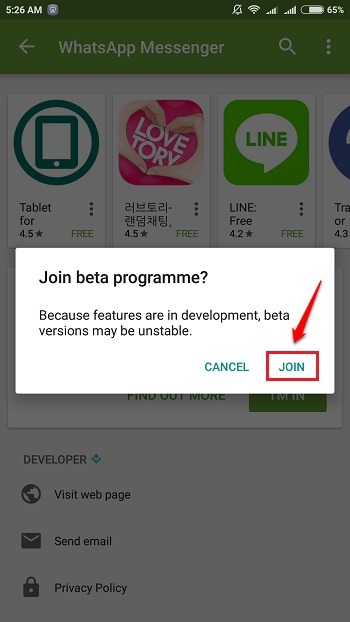 Note: If you want to revert back into the normal version and stop being a beta tester, you can always do that by uninstalling the beta app and installing the normal one. When you become a beta tester, you are dealing with an unstable version. So you won’t have the option to rate the app. Instead you will be able to send feedbacks for the app, which can be seen only by its developer. 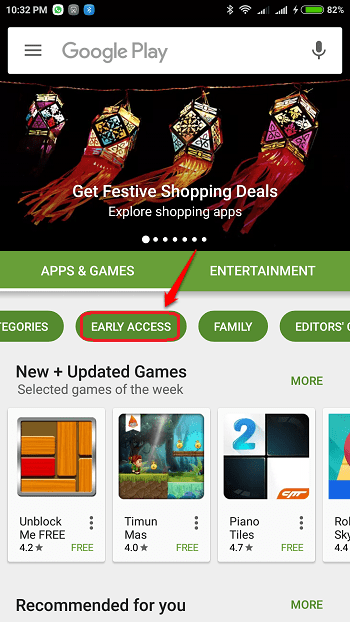 To view the unreleased apps and the games under development, you can launch Play Store and click on the Early Access tab as shown in the screenshot given below. There you are! Have fun exploring the unseen. Don’t be one among the millions; be one among the selected few. Get your beta version today itself. Hope you found the article useful. If you have any doubts regarding any of the steps, please feel free to leave comments, we would be happy to help. Do come back for more as there is always something new waiting right here for you.